Calpipe Calbrite™ Flex 45-degree connector of trade size 1/2-Inch, is suitable for use with Calbrite™ bare, PVC and clear coated flex conduit. 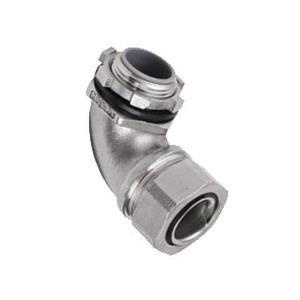 Connector features 316 stainless steel construction and brite finish. Connector with male connection, has thread length of 0.5-Inch. It helps to connect stainless flexible conduit to other fittings. It measures 1.95-Inch x 1.25-Inch x 0.75-Inch. Connector is UL listed and meets ANSI standards.